Its footprint is about 80 percent smaller than that of plastic water bottles. Why didn't someone think of this before? 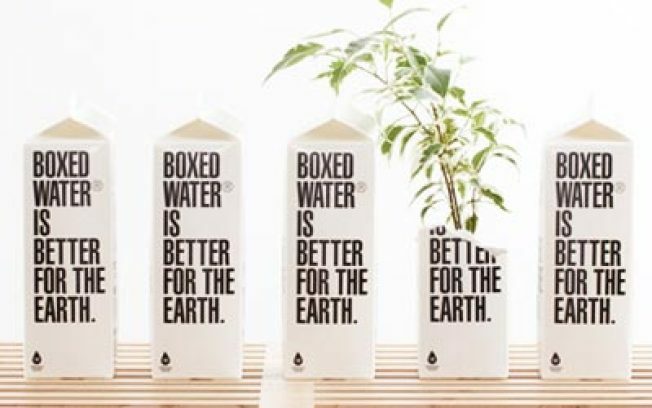 Boxed Water: The new, earth-friendlier alternatve to bottled. Boxed Water is Better is a Michigan-based company started by some folks who looked at all the waste involved in plastic water bottles, and figured there had to be a better way. Enter Boxed Water, which looks like an old-school milk carton. The container is made up of 90 percent recycled materials (the rest comes from sustainably-managed forests), and the boxes can ship flat and be filled on-site. To ship the same amount of water, you'd take up about 5 percent of a single transport truck with Boxed Water, compared with the 5 whole trucks plastic bottles would require. If you can't find Boxed Water near you quite yet, it's because the product launched a mere week and a half ago (you'll find a short list of stores that carry it on their website). Once the creators have covered their launch costs, they'll be donating 10 percent of their profits to world water relief foundations. Meanwhile, drop them a line and ask them to start shipping to your local store.